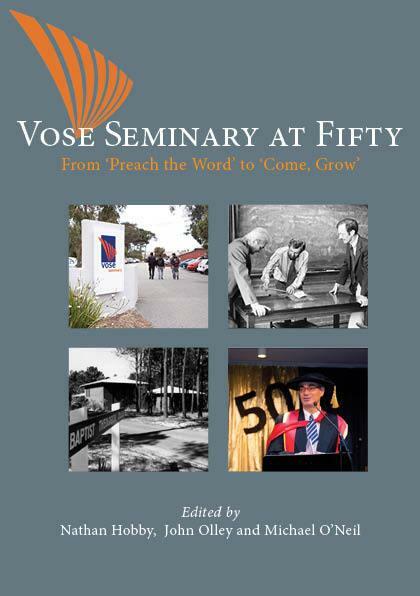 Vose Seminary began as the Baptist Theological College of Western Australia in 1963. To celebrate the fiftieth anniversary, this book brings together a collaborative history of the seminary with essays examining shifts in the church and theology over those fifty years. The contributions from twenty-five Vose staff, students and graduates demonstrate the generous evangelicalism which marks the seminary. The book is an account of where Vose Seminary has been over the last fifty years and an attempt to define the task which lies ahead for theological educators in equipping the church for the future. The story of our seminary is an important one for the church in Perth. The different contributors reveal some interesting things, such as the story of Ruth Snell, an early student who went on to become the first woman to be a Baptist senior pastor in Australia. Reading Karen Siggins’ essay on women at Vose Seminary, I was struck by how far we have come, and yet how much further we have to go. More than any other part of Vose Seminary, the library bears traces of its past—an accumulation of books, journals, shelving and paraphernalia from throughout its history. Since I began as seminary librarian in 2008, just as BTCWA was about to become Vose Seminary, I have been intrigued by these pieces of the past woven into the library. Many books bear the names of previous owners; there are hundreds from some donors—Noel Vose, Geoffrey Wild, A.C. Maynard, Ruth Atkins. A separate collection of history books bears the name of Professor Herbert Hallam, a medieval historian at the University of Western Australia; they were donated in 1994 after his death. Many others bear the stamps of defunct libraries, such as the Perth Diocesan Library. A number of books still have the borrower cards which became obsolete with automation. There are always familiar names written on these cards; it is a particular kind of pleasure to know a friend or mentor read the same copy of a book a decade or two ago. You can buy the book from Mosaic Resources (the publisher) – https://mosaicresources.com.au/titles/9781743240960. Or you can come to the launch and buy a copy there! It’s happening on Tuesday 27 August at 5pm at Vose Seminary Library, 20 Hayman Rd, Bentley. RSVP: http://www.vose.edu.au/view/news/vose-50th-celebration-service. Here’s a full listing of the contents, because you won’t find it anywhere else on the web.